Mother's Day is tomorrow - Sunday, May 14, 2017! My favorite gift to receive is always Lush goodies - you can check out my review of the gift baskets my husband and son got me last year here, and in 2015 here! This year Mother's Day is extra-special to me - we welcomed baby Elliott in to the world just under 3 weeks ago! My family is complete and i'm excited to spend my first Mother's Day with all my boys!! Lush Baa Bar Bubble Bar ~ $7.95. This adorable bubble bar's tranquil perfume has a sleep-inducing effect on anyone who smells it, so you can forget about counting sheep. Instead, tuck into a blanket of soothing clove and rose bubbles before bed to help you drift off to dreamland. This bubble bar has everything in it to relax and soothe you - lavender, jasmine, rose and more! This smells amazing! Seriously, this is just what I need in a good bubble bath before I have the best sleep ever - I can't wait to use this! Plus this bubble bar is so stinkin cute! Lush Mom (Pink) Bath Bomb ~ $7.95. Pop this fizzer in the bath and watch it release pink swirls of Sicilian lemon and sweet orange with refreshingly floral hints of rose. It's the perfect accessory for a carefree afternoon: crack the window open, breathe in that fresh spring air, listen to the birds chirp and wash your worries away. Doesn't this description make it sound like the perfect bath bomb?! It smells delicious! 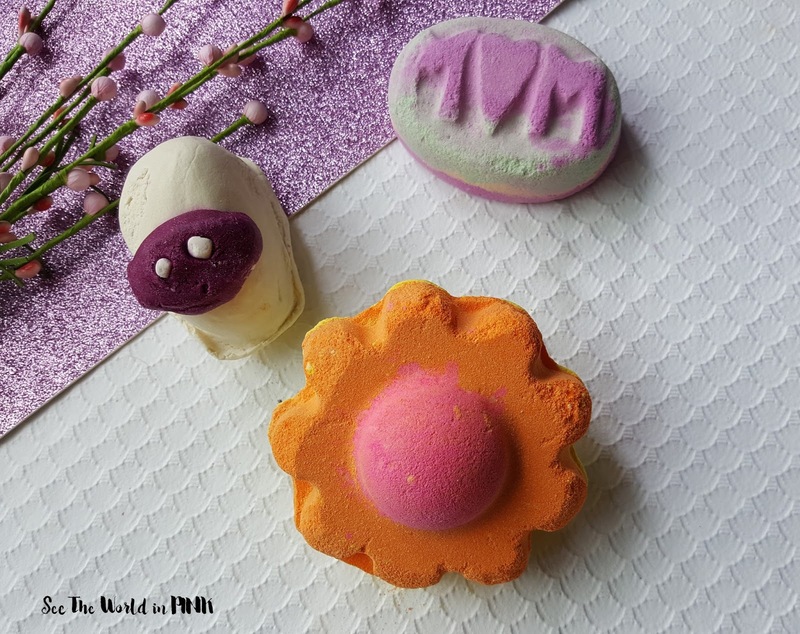 It is nice and refreshing - a great pick-me-up bath bomb that is adorable! This is a double-sided bath bomb - one side is yellow and blue and one side is orange and pink! I'm sure this is super colourful when it is in the bath, which will be so fun! The scent is a really interesting blend of orange and floral notes! Lush Your Mother Should Know Bubble Bar ~ $12.95. A soak with this multicolored bubble bar quickly transports you to a zen state of mind with a grounding yet refreshing perfume of rosewood, grapefruit and neroli. Crumble it under running water and retreat into a fluffy, floral cloud of relaxation. Your Mother really should know about this one! This bubble bar is huge!! Seriously! This should easily last you 3-4 baths - I will likely just divide it in 4 to make it easy! This has a really delicate, relaxing scent! Can't wait to use this! 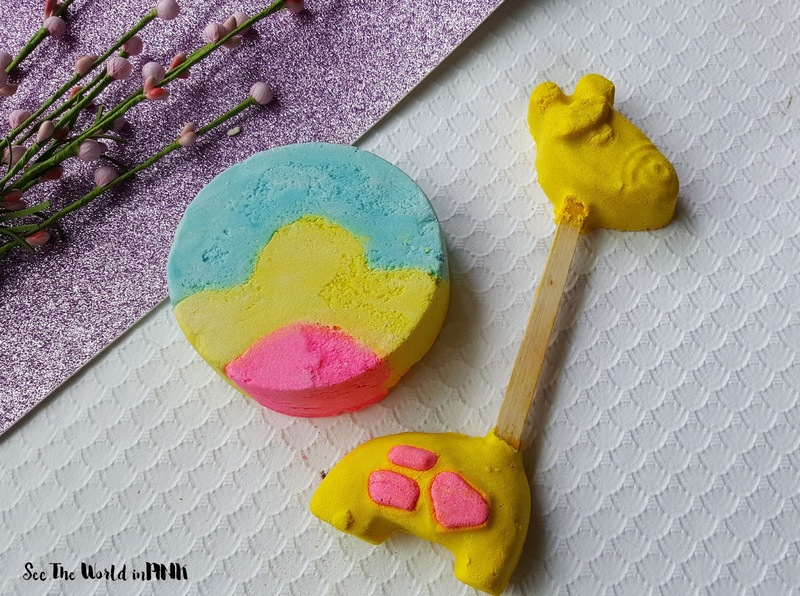 Lush Elsie The Giraffe (You're Havin' A Bath) Reusable Bubble Bar ~ $9.95. Enjoy the freshest baths with this adorable triple citrus reusable bubble bar. A zesty blend of lime and lemon will refresh your inner sparkle as grapefruit lifts you to lofty new heights. Just hold your bar under the tap as you run your bath, splash around to create loads of bubbles, and set Elsie aside for more uplifting soaks. How friggin cute is this guy?! Seriously! This was one of the items from the Mother's Day collection that I HAD to HAVE! And it doe not disappoint! This is so refreshing - I absolutely love grapefruit scents and that is exactly what this smells like! These reusable bars are great to use - run it under the faucet, let it dry, use it again until it's done! You pick how much or little you want to use! 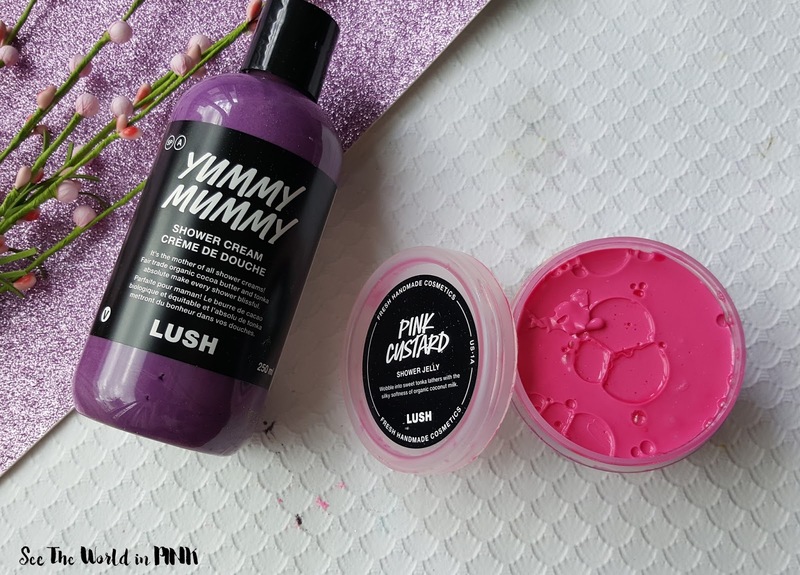 Lush Yummy Mummy Shower Cream ~ $19.95 for 250 ml ($9.95 - $29.95). This pretty purple shower cream will have you turning heads (and noses!). Geranium oil, Brazilian orange oil and tonka absolute are expertly blended together to create one of our most intoxicating, yet delicate, fragrances. Fruity, sweet and full of fair trade organic cocoa butter, Yummy Mummy will leave skin unimaginably soft and smelling like juicy strawberries. It’s well deserving of its name! This is Lush's signature Mother's Day scent - I get a new one every year because it smells so good! Also, the shower creams are awesome! The texture is great - I have lots of them and this is one of my fav scents! Lush Pink Custard Shower Jelly ~ $7.95 for 100 g ($7.95 - $12.95). A whiff of this sweet, mouthwatering tonka and vanilla jelly might make you want to grab a spoon, but we implore you not to taste it: we promise it's much better on your skin than your tastebuds! Washing with ingredients like skin-conditioning coconut milk, sweet golden syrup and mineral-rich seaweed gel will leave you delightfully soft all over and smelling like a dream. These jellies are so fun - the texture is so unique! This one smells delicious and is the perfect Spring scent! These are fun to use - I usually save the jellies for the bath, not the shower, so that the package doesn't fill up with water! 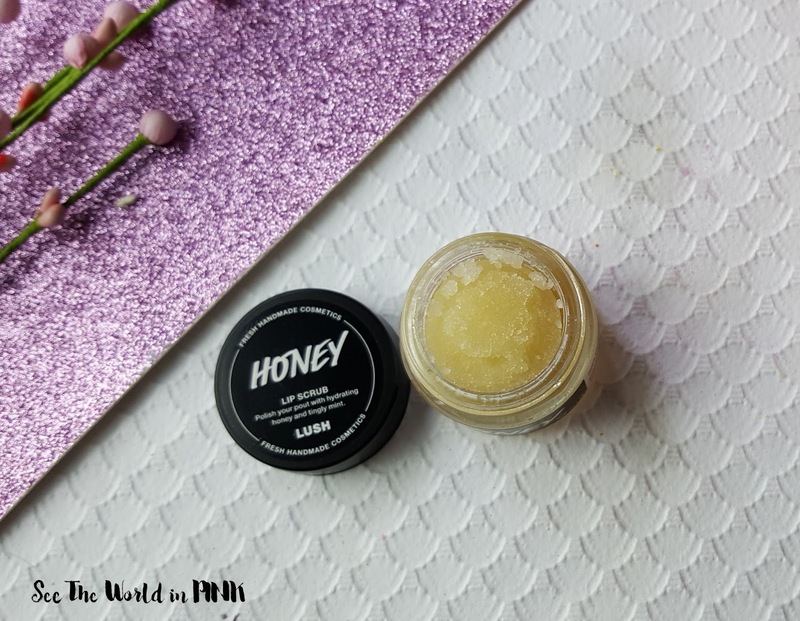 Lush Honey Lip Scrub ~ $9.95. All of our lip scrubs are made with castor sugar, but this might be the sweetest treat yet, made with a lip-smacking combination of syrupy honey, creamy white chocolate and aromatic vanilla. A quick scrub with a pinch of this gets lips bee-autifully soft thanks to conditioning jojoba oil, prepping them perfectly for a lip tint or lipstick. The lush lip scrubs are amazing! I have talked about them lots before! This one smells amazing - who doesn't love the scent of honey, chocolate and vanilla mixed together?! These work really well too! 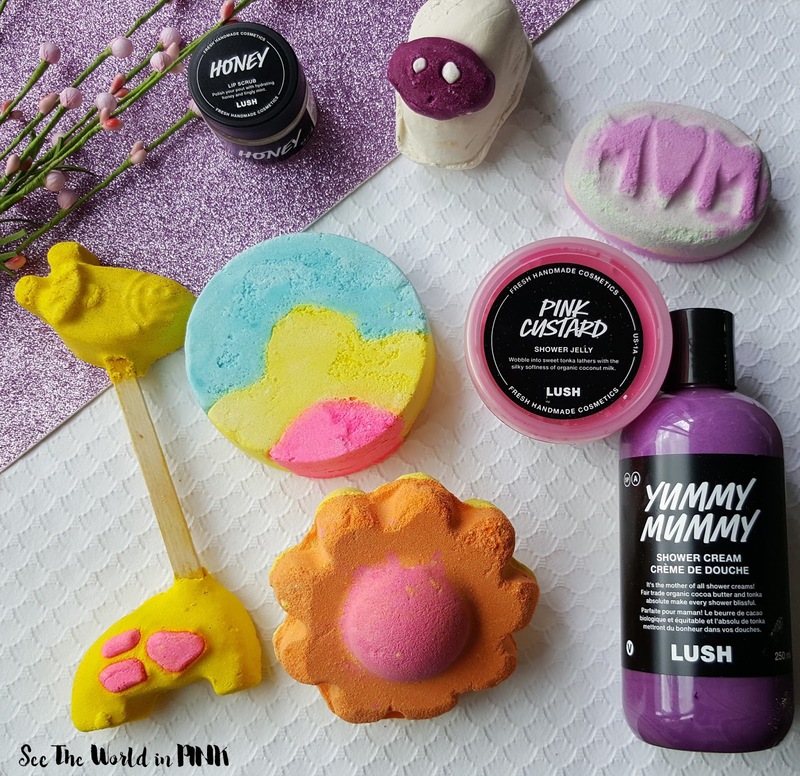 So, that is my Lush Mother's Day collection - there is only 1 item from the Mother's Day collection that I couldn't get my hands on and that is the Scrubee Body Butter - this is a solid body butter bar that looks like a bee! It was on my to-try list, but sadly it was sold out! Too bad - I was still pretty spoiled this Mother's Day! If you are still looking for a last minute gift, I always recommend any Lush goodies to treat any Mom in your life! *Some products are PR samples and some were purchased as gifts - all opinions are my own!